With The Flash season 3 premiering next Tuesday, news and teasers have been coming fast and furious. Check out what we know so far! “Magenta” Synopsis, and Superhero Fight Club! This entry was posted in Round-Ups on September 30, 2016 by Kelson. It’s been a big week for the Flash in comics, with Barry Allen and both Wally Wests in The Flash #7, Titans #3, and Teen Titans: Rebirth. Here are our reviews of all three. Enjoy! The Teen Titans have lost their leader (at least they think Tim Drake is dead), and each of them is trying to move on with their lives as best they can. But…someone seems to have other plans for them. 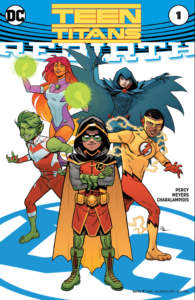 Just who that is, and how this person goes about their task…well, you’ll just have to follow us after the jump to learn more, but it IS a good start to a new volume of the TEEN TITANS! This entry was posted in Reviews and tagged Damian, REBIRTH, Teen Titans, TeeTee on September 30, 2016 by Ed Garrett. The CW has posted this year’s Fight Club promo clip, although this one features the heroes rather than the villains we saw last year. It features Barry, Supergirl, the (Green) Arrow, and some members of the Legends Of Tomorrow in a group training session. Obviously it’s meant to welcome Supergirl into the CWverse fold! And the official synopsis has been released for the third episode of The Flash. Titled “Magenta” (I think you can guess who’s in it), it’s due to air on October 18th. EARTH-2 WELLS AND JESSE RETURN TO CENTRAL CITY — Barry (Grant Gustin) and Team Flash are thrilled to reunite with Earth-2 Wells (Tom Cavanagh) and Jesse (guest star Violett Beane). Wells confides to Barry and Caitlin (Danielle Panabaker) that Jesse has all the powers of a speedster and has been saving people on his Earth. He is concerned about her safety and wants them to talk her out of using her powers. Meanwhile, Magenta, (guest star Joey King) a new meta who can control metal, terrorizes the city. Armen V. Kevorkian directed the episode written by Judalina Neira & David Kob (#303). Original airdate 10/18/2016. It’ll be good to see the return of Earth-2 Harry and Jesse, and even better to see her in action as Jesse Quick! Who’s looking forward to it? This entry was posted in Media and tagged Arrow, Flash TV Show 2014, Legends of Tomorrow TV Show, Supergirl on September 29, 2016 by Lia. The CW has released the official still images from the second episode of the upcoming season, titled “Paradox”. 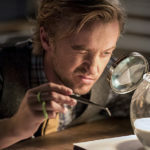 They include our first look at Tom Felton’s character, Julian Dorn/Julian Albert, and a nice glimpse at Barry and Jay Garrick together. You can see the full batch of photos at Flash TV News. Also, CBR has revealed the identity of the villains in the CW’s four-series crossover: they’ll be the Dominators, the alien race from DC’s Invasion! storyline. It’s a very ambitious goal, considering the aliens’ creepy and inhuman appearance, and showrunner Marc Guggenheim says “We’re using cutting-edge prosthetics and computer effects to achieve a feature film-quality look which is faithful to Invasion! artist Todd McFarlane’s interpretation of the characters.” So it’ll be interesting to see how they pull it off. There’s no word thus far on what the Dominators will be doing in the episodes, but it’ll probably be big. Excited for the crossover? What do you hope to see in it? How about the meeting between Barry and Earth-3’s Jay Garrick? Share your thoughts! 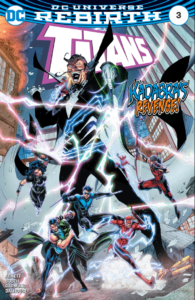 This latest issue of WALLY AND THE TITANS (I mean, really, that’s what it is and I’m glad of it) continues an outstanding first arc as the battle with Abra Kadabra continues. Think you’ve seen the last of the doppelgangers? Think again! Think even Kadabra understands everything that happened? Think again! Think you can afford to miss out on THIS series? Yes, Think Again! Want to know more? Think ag….no, wait, just follow us after the jump! This entry was posted in Reviews and tagged Abra Kadabra, Flash, Review, Titans, Wally West on September 29, 2016 by Ed Garrett.